This week, there was an announcement about a new mammal from the Mesozoic (around 250 – 65 million years ago) from Japan. There’s not yet a scientific paper describing this find, so I’m only going to describe it. The mammal is a multituberculate (mul-ti-tu-BER-cu-late). These were rodent-like mammals that lived from the Late Jurassic (153 million years ago) to the Oligocene (35 million years ago). They are unique in having many more bumps (or cusps) on their teeth than other mammals, which is what ‘’multituberculate’ means: many bumps. One of their teeth, the premolar, is very large and forms a serrated cutting edge, like a really round steak knife. A) A multituberculate skull. B) A tooth showing the many cusps. C) The premolar. This new fossil has a partial skeleton preserved. Usually we only find teeth or partial skulls of these animals, so finding a partial skeleton is rare and amazing. It will help answer many questions about multituberculate biology. 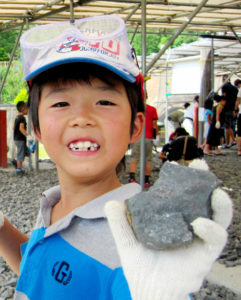 The other interesting thing about this fossil is that it was discovered by an 11-YEAR-OLD boy who was attending a fossil excavation event in the Katsuyama Dinosaur Forest Park. This is exactly why it’s so important to find local opportunities to participate in fossil events. ANYONE can find fossils as long as you’re in the right place. Kakeru Funato, the boy that found the fossil.